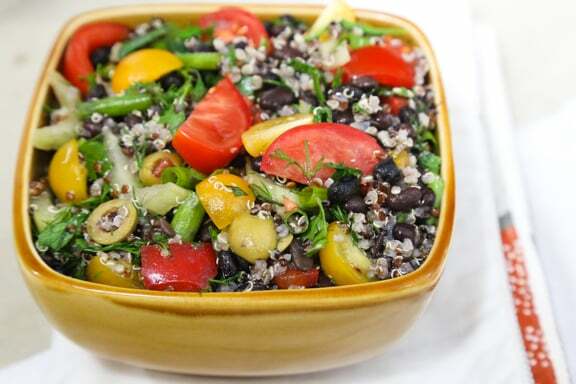 Light-tasting yet substantial, this cool couscous or quinoa and black bean salad gets its spark from fresh herbs, tomatoes, and olives.This is a delicious accompaniment to grilled vegetables. If you have some parsley left over, boost the herb-alliciousness of the salad with Parsley Salad Dressing. Photos by Evan Atlas. If using couscous: Combine the couscous with 1 1/3 cups boiling water in a heatproof container. Cover and let stand 10 minutes, then fluff with a fork. If using quinoa: Combine the quinoa with 1 1/2 cups water in a small saucepan. Bring to a rapid simmer, then lower the heat and simmer until the water is absorbed, about 15 minutes. Remover from heat. Let either grain cool to room temperature (or you can do this ahead of time and refrigerate until needed), then combine with the remaining ingredients in a serving container and mix thoroughly. Cover and let stand for 30 minutes or so at room temperature before serving, if time allows. 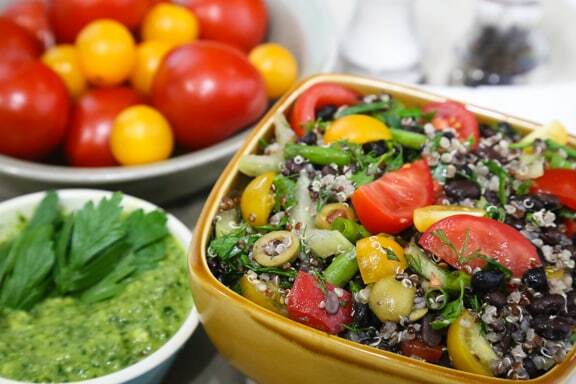 Here are more recipes for grain salads.